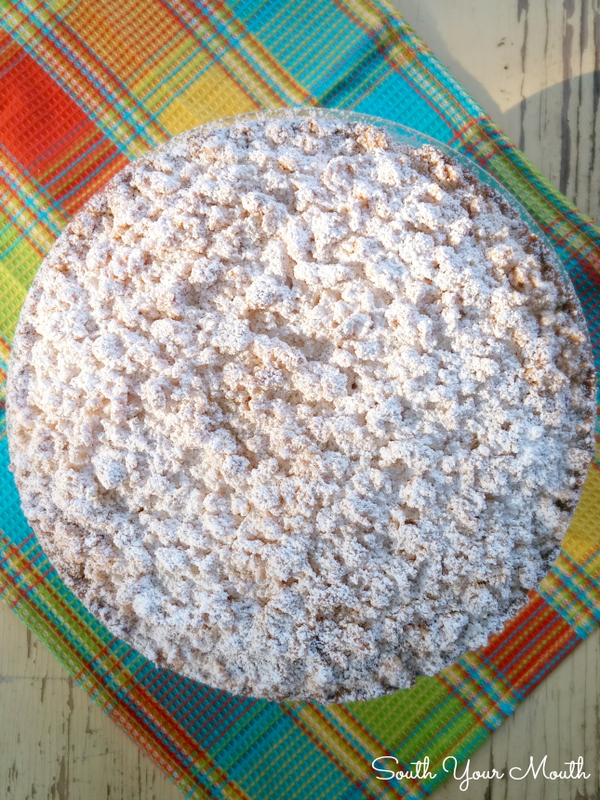 A tender lemon-kissed cake with lemon cheesecake filling topped with a crumb streusel topping dusted with powdered sugar. There are a million reasons I love this cake. First, it’s super easy (even though it looks totally complicated and fussy) because you use a box cake mix. Side note – if you have a simple white cake recipe that you love, you just go ahead and rock that sucker out. Wait, I have to tell you a funny story real quick about cake mixes. Well, it’s more mean than funny but I have to laugh at the wicked comments I get on my recipes or I’d go nutters and have to move into my parent’s garage. OK, lady. What you gonna do? Take away my card? It totally looks like something from a fancy-pants bakery. It has just the right amount of fresh, crisp, lemon zing. It’s AH MAZE ING with a hot cup of coffee or tea so if you’re having company, this would be a perfect after-dinner dessert. If you want to WIN the potluck or just outdo your sister-in-law, this is your recipe. It’s got this coffee cake thing going on with the crumb topping so that’s just awesome. The lemon cream filling is so absolutely perfect you could just go sit on the couch and eat the whole batch with a rubber spatula. The contrasts of the firm crumb topping, tender cake and creamy filling is like a party in your mouth. It would be amazing served with this Vietnamese Iced Coffee that I've been dying to make! Combine sugar, melted butter, flour and salt in a small bowl and stir with a fork until combined and crumbly. Set aside. Prepare batter per manufacturer’s instructions (do not over-mix the batter). Stir in lemon zest. Pour into a greased and floured 10-inch springform pan. Crumble crumb topping evenly over cake batter. Once crumb topping is added, bake immediately for 35-45 minutes or until cooked through. Cool completely then slice in half horizontally. Combine cream cheese, powdered sugar and lemon juice in a large bowl and mix until well combined and smooth. In a separate bowl beat whipping cream until soft peaks form. Fold whipped cream into cream cheese mixture until well combined. The mixture needs to be thick enough to support the cake - add more powdered sugar if necessary to ensure the cream filling is thick enough. It is VERY important to bake the cake immediately after adding the crumb topping and to not overwork the batter when mixing to ensure the cake cooks properly. You can use a yellow or even lemon cake mix if you prefer. I’ve just always liked the way the white cake looks and it doesn’t have as much added artificial flavor that would compete with the real lemon flavor. You can substitute cool whip for the real whipped cream if you prefer. I’d think about 2-3 cups would work. If you don't have a springform pan, just use two 9-inch cake pans, dividing the batter evenly between the two. Top one with the crumb topping then bake per manufacturer's instructions for two 9-inch pans. Be sure to also check out this recipe for Fresh Strawberry Yogurt Cake if you love fruity cakes with a tiny bit of tang! It's delicious and beautiful too! This looks amazing! I am doing an inventory right now in my mind, because this baby is getting made soon! Please consider something for me. I like to print the recipes as well as pin them, so I can tape it to the cupboard in front of me as I cook. Would you take out the photograph on the printable version or make it an option? Thank you! You're literally the first person who's ever asked for that LOL! I didn't have photos on the printable recipes until about a year or so ago but SO. MANY. PEOPLE. asked (and not always very nicely) for me to add a photo so I did. You could copy/paste from the printable version in a word doc if that works better. Good luck! Good Grief People! The lady is wonderful enough to take the time to publish these recipes for you, the VERY LEAST you can do is take the time to learn how to use your PC, and how to COPY and PASTE! Simple to do, but maybe to simple for you! P.S. Thanks for ALL the great recipes you have posted, Mandy. Great work! Really it isn't that difficult to delet a photo from a recipe!!! This person is nice enough to share a recipe with all of us and then someone comess along and takes it a step further thinking only of themselves when it is a simple fix that you can easily do yourself. I too would like to thank you for sharing this recipe! I will be making this very soon. Again, thank-you Mandy. Oh my gosh! This looks incredible. What size springform pan? Well this Southern girl uses cakes mixes all the time and no one can tell under a good homemade frosting! I was born & raised in metro Atlanta; no one can accuse me of not being Southern enough, and I use cake mixes all the time too. You are right, homemade frosting makes it yummy every time. People are surprised when I admit it is from a box! Hey Mandy, this looks like a 'to do' recipe right away! Just want to give you a cyber hug as I think you are a ray of sunshine and I love your style! Take care! I just love your cute, precious self and also your incredible recipes!! Oh Mandy, Thank You so very much for this lemon recipe. I was wanting to make something "lemony" and I think this is just the goody to try! I love to read your intro to your recipes . . . you do have a wonderful sense of humor (sure does take us a lot further in this strange world we live in!!). Anyway, I look forward to your e-mails and catching up on "your world of living". Thanks again for sharing your delicious recipes with us! I have two birthdays coming up in the next week and this seems like an easy and refreshing dessert. Thanks Mandy! Thank you for this beautiful cake recipe. I too am a Southern Belle. I have a career that keeps me awfully busy, so using a cake mix does not mean I loose my 'Belle Card'! Thank you, thank you for presenting recipes that help me get things done a bit more quickly in my kitchen. SOUTHERN GIRLS UNITE! I'm in Australia and often have problems trying to find the right ingredients. This seems very straightforward, but I'm wondering whether 'all-purpose flour' corresponds to our 'plain flour' or our 'self-raising flour'? Hi, gotta tell you I loved this. Also gotta tell ya, I did it in two rounds instead of springform pan, and the top layer kept sliding off the bottom, I actually had to put skewers in it to hold in place. Who cares it is so good, thank you so much for sharing it! Whatever works, right?! I would imagine it doesn't slide around on the springform version because the two surfaces enclosing the filling are "rough" or "open" so they latch on to the filling. Maybe next time saw off the top and bottoms of your cakes with a serrated knife and see if that helps! I made this deliciousness today. I don't have the pan you described, so I tried it with 2 9" round cake pans. No trouble with the crumb topping staying where it belonged. When I tried to depan them, they broke. Consequently we ended up with trifle. This recipe is special. So tasty and easy. Thank you for sharing it with us. I just wonder if a clumsy man like me can make this? Thanks for sharing! Great work! This cake looks delicious. I love cooking. I can made various cake in one day. Thank you for share the recipe. I like use a lemon to made cake.Taste so good and smooth. I will make this cake in a weekend. I made this cake this evening for a friends birthday, I'm not going to be able to give it to her unfortunately because the top layer is cracking after putting the cream center onto the bottom. If I had to do it all over again I would refrigerate the creme filling longer to set up more, apply it to the bottom, perhaps refrigerate this layer a bit longer prior to applying the top layer....the creme filling on my finger tastes Devine!!! Thanks for the recipe, I will be trying it again. I love baking in my free time. This cake looks delicious. I will make it this weekend to have with my family. Thanks for your tutorial. How many egg whites you did not say. Well, this recipe looks so great and yummy, i love baking and I have just made this cake but it is not amazingly gorgeous as you did, a little sad about this. However, it is delicious as i think when saw your recipe lol, my kids really love its taste. Thanks for sharing! This is a very good dessert! I did make my own cake, using the best white cake recipe from Cook's Illustrated and I did add some fresh blueberries and raspberries to the inside. Everyone loved it! I would agree that layers should be split - the rough edge will help keep from slipping. I found the dessert best when left out about an hour before serving to soften the cake. Beyond that there is greater risk of the filling getting too soft. Regardless, it was delish! Just FYI: I used smaller baking rounds, adjusted the time a tad, and still ended up dividing each finished cakelet in half for serving. It was perfect. 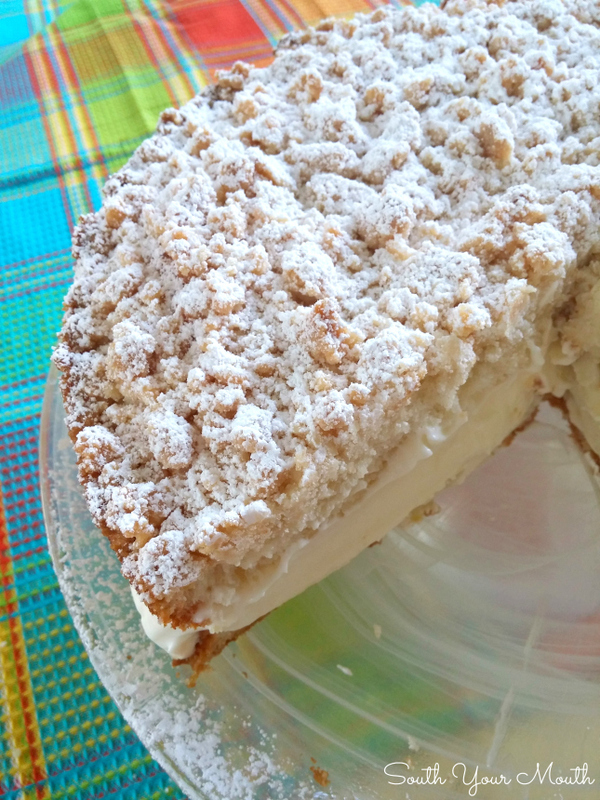 The lemon crumble cream cake is liked by many of the people,but most of te people do not know how to prepare the lemon crumble cake at home.They are professional writers for hire to make some delicious recipe at home as it save many times for the benefits of both of the host and guest.Would you please share some more picture of making the crumble cream cake that will be made at home? Mandy, I just made your fabulous Lemon Crumble Cream Cake and am serving it at a birthday dinner tonight for my mama. Yum! My crumbles didn't stay on top of my batter and disappeared into the cake. Have you ever had that happen? It will be fine. I made a little extra cream and frosted the top as well. Just curious what I did wrong. Thank you for this fabulous recipe. It's a keeper! Hmmm.... I'm not sure. If the batter sat for a while in the pan (like while you made the crumble maybe?) it may have started to break down a little. Or sometimes they get thin if overmixed. I've made this about a half a dozen times since I posted the recipe and haven't had any issues. Good luck next time though!! My crumbles also sunk to the bottom of the cake. I think next time I will bake the cake about half the time and then put the crumbles on and finish baking. Sounds perfect, what is 1 pack of white cake mix? Is it like a "Betty Crocker" packet mix???? Betty Crocker, Duncan Hines, Pillsbury... I usually buy whatever's on sale! You're making me hungry! Sounds so good! I LOVE your site. Can't wait to get your book. 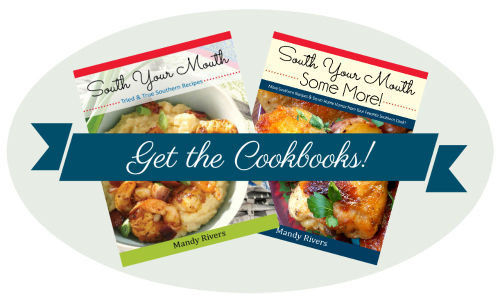 I'm not a "real" Southern Belle, but I feel like one in my mind and heart, because I love Southern dishes, especially yours. Thank you, Mandy!! Is the crumb topping not made with with brown sugar? I've never seen a recipe for a crumb topping with plain white sugar before. I would like to make this for my son but just want to make sure about the topping first. Thank you! I would like to try this without the lemon juice, do you think I need to add anything in its place? I want it to be only vanilla flavor. I made this for Christmas. the filling is great. I used lemon juice. I used 2 9" pans. The layer with the crumb topping took longer to cook, which then my crumb topping ended up hard. The top layer also cracked and tried to fall off, so I used saran wrap to keep it together. It's very good, I just need to figure out how to work out the problems. I'm thinking of adding the crumb topping later in the baking time would work. I made this today and it came out perfect! I will definitely make this again! I've made this recipe many times (I find reasons to make it) & it always comes out perfectly....and really impresses everyone. For Christmas, I decided to branch out from the basic....used a pumpkin cake mix (still made with egg whites vs. whole eggs), added diced dried cranberries that had been soaked overnight in Grand Marnier to the crumb topping, and used fresh orange juice & a little more Grand Marnier instead of lemon juice in the filling. Another hit...especially with my 93 yr old mother who always made marvelous cakes from scratch! This cake was delicious! My girlfriends loved it! I used the 2 cake pans, So I wouldn't have to cut the cake in half. After pouring the cakes in the pans I sprinkled sugar over the top of the cake (The one that would be the bottom half) before baking it, That stops the cake from rising so much, So the top will be flat and easy to work with. I also used the lemon cake mix instead of the white mix...This recipe is AWESOME!!! Thanks, Mandy! Love the cake recipe dont care for any quote from Lindy West, the example from the ME,ME, ME generation. Made the lemon crumb cake today and unable to upload the pic. It was very delicate, when I cut in half and removed top it fell apart. I was able to put back together after I packed cream onto it. Tasted fine! This was fantasic! The cake didn't even last 48 hours in my house. The only change I made was adding some spoonfuls of country time lemonade mix to the crumb topping. I used King Arthur's gluten free yellow cake mix and cup4cup gluten free all-purpose flour. The crumb topping sunk into the cake as it was baking. Any suggestions? Thanks. Try lightly mixing the topping mixture ,leaving some flour visible. Made it and it is so pretty and so yummy. Thanks so much for the recipe. This cake looks absolutely amazing. I'm from the south, and I have not shame in using a cake mix! Do you happen to know how long I could leave this out at room temperature and it still cut easily? Thanks so much! WOW! Fantastic recipe! Everyone loved it!